I may have mentioned this before: our boat was filthy when we bought it. We carved out a long weekend and went down to clean it up. This trip was also a great test of our soon-to-be reality since we would be living on the boat for the weekend. 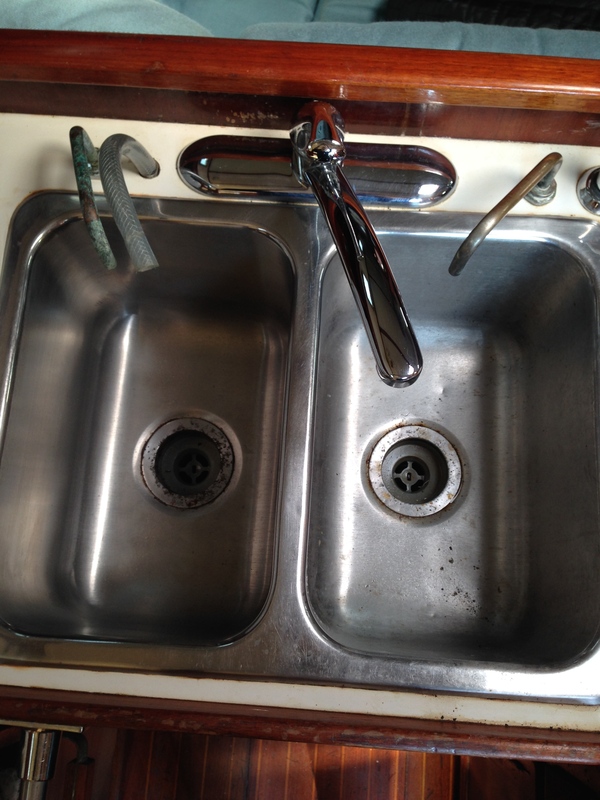 We figured if we could do it while it was dirty we’d be able to do it when it was clean. Armed with optimism and cash from selling our furniture we flew to Raleigh, rented a car and drove past the cosmetic surgery signs and the Pork Center. We arrived around lunch time and got straight to work. And, by straight to work, I mean stopping by the store to purchase dust masks, cleaning supplies and rubber gloves. Oh, and sleeping bags and pillows. Then we started cleaning. 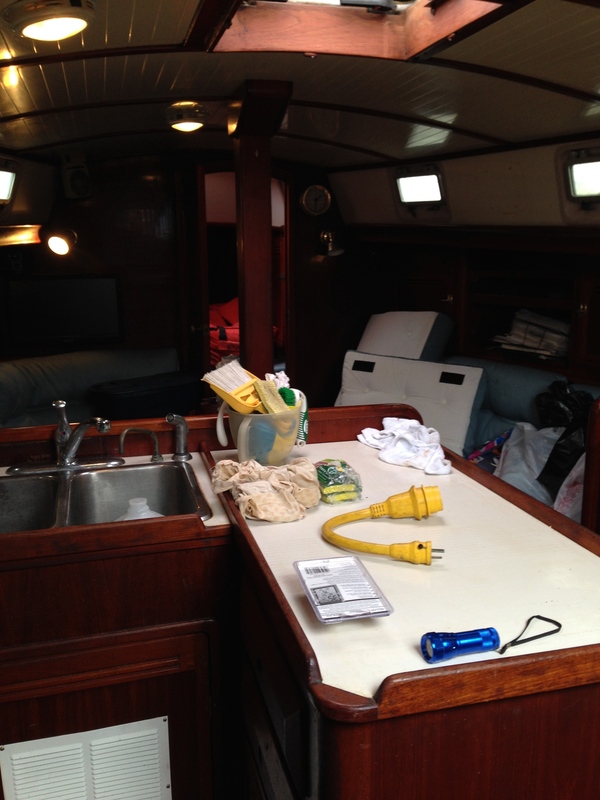 My job was to clean the Vee berth, which was where we were going to sleep. The job of my Better Half was to start removing the crap that had been shoved in every conceivable place. 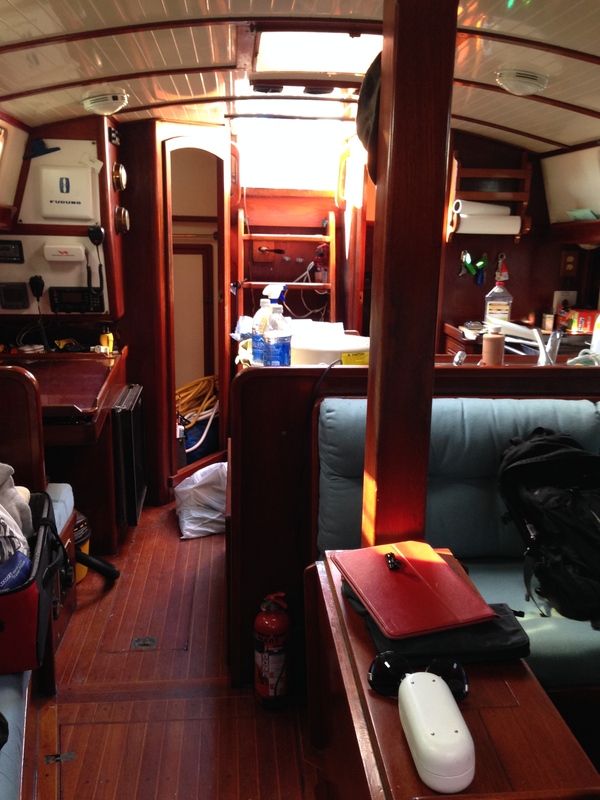 There are two berths (land term = beds) on our boat. One up front (boat term = forward, also called the Vee berth) and one in the back (or, aft. 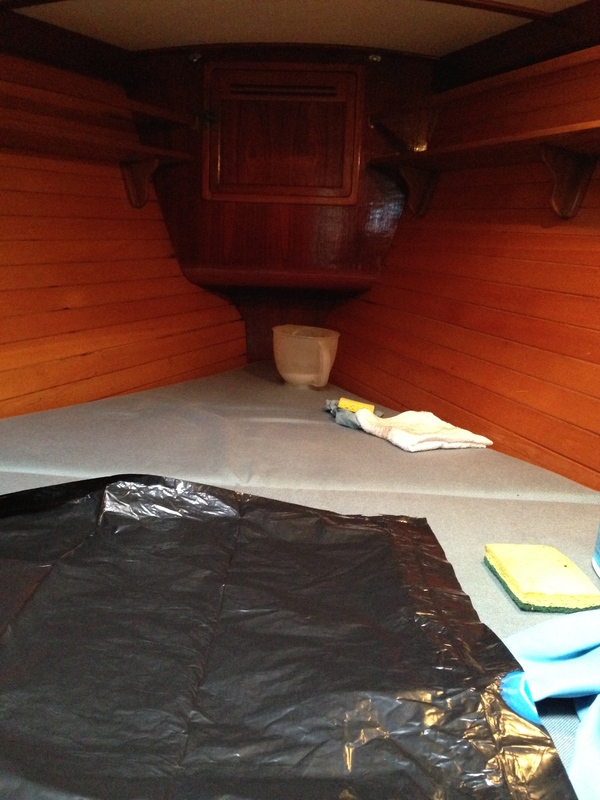 It’s also called the trunk berth). The Vee berth gets it’s name because it’s shaped like a Vee. The aft bed is larger but that area had been so packed full of stuff that we couldn’t get to it. No telling what we would find in there and that was the reason for our respective jobs. 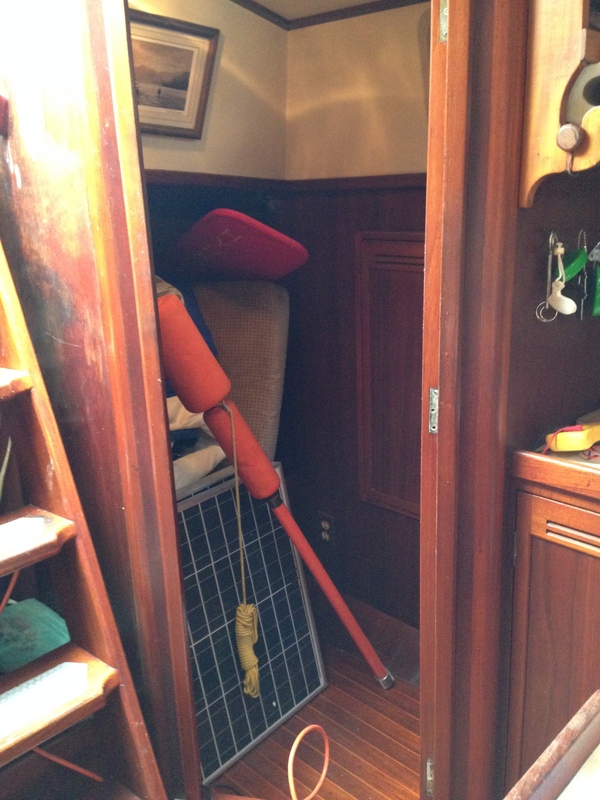 That’s the opening of the 8′ long trunk berth, full of stuff. I began cleaning for real around 1:30. There are a lot of things I take for granted that I had to figure out. Like water. Where do I get water? Find container, climb down the ladder (we are still on the hard, 10ish feet in the air), walk over to water spigot, fill container, walk back, climb ladder, try not to drop container, ration every drop of water like I’m trekking through the Sahara. Did I mention that it was raining? Better Half was throwing things off the sides of the boat like there was a fire. Anything that we couldn’t immediately identify as useful or salvageable went over. Moldy cushions, moldy life jackets, jars of rusted nails and screws, dried up rubber bands, rusty pieces of metal, scraps of wood, old equipment with corroded wires and unreadable decals, a full-size window air conditioner, and on and on and on. I cleaned and cleaned and cleaned. By 7:00 I was satisfied that we could sleep in the Vee berth and probably wouldn’t catch Black Lung disease or anything else. 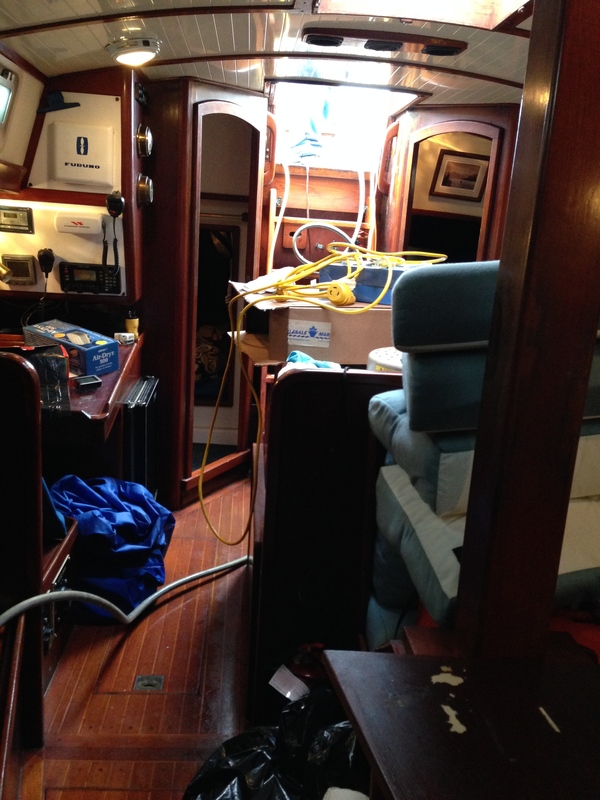 The aft berth was still stuffed full; untouched… We made ourselves as presentable as possible and went to dinner. Did I mention it was raining? And cold? That yellow plug had a screw in the plastic bit instead of a grounding prong. Safety first! After dinner we came back to a warm, dry boat plus it had stopped raining! Our boat is made of steel and very well insulated. We had been using a small space heater to take the chill off while we were working and, although we had turned it off while we went to dinner, it stayed warm and cozy. So fun! It was nice to see progress even though we had a long way to go. We walked over to the marina building for showers, zipped our sleeping bags together and climbed into bed. Above our heads there is a large hatch; through the glass I could see our mast towering above us and the stars beyond. It was an enchanting way to fall asleep. We were woken a few hours later when drips started forming on the hatch and falling onto our faces. Condensation is a real thing. We propped open the hatch with a random stick that hadn’t been thrown out yet and went back to sleep. The next day we woke early, had breakfast and kept cleaning and throwing. 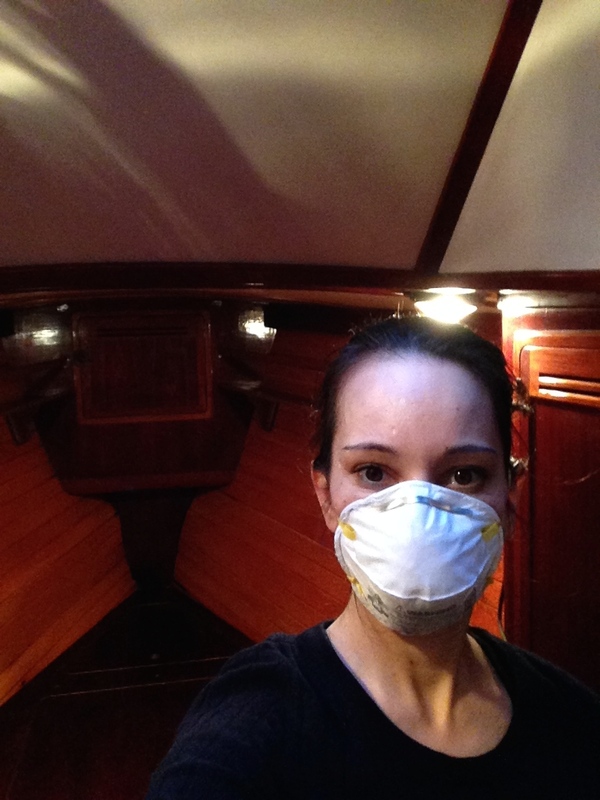 I cleaned the salon (which is the boaty word for living area) working my way back from the Vee berth and started on the galley (kitchen). The galley was beyond gross. Better Half kept throwing things away from the storage area we are calling Narnia (because it seems to be an entire world unto itself) and the trunk berth. He would chuck things over the side and then, when it was a large enough pile, would drive it over to the dumpster in the back of our rental car. I contributed to the trash by throwing out crumbling melamine dishes, bent silverware, a pot that was nearly burnt through, a teapot that wouldn’t open, etc. That was Saturday. Sunday was more of the same. I started on the stove and realized that it would need to be replaced ASAP. It was so grease crusted and rusted that I had trouble knowing where one stopped and the next started. The grate was burned through over one of the burners and many of the screws holding the thing together were missing. Looking inside the oven I found that there was a 2″ gap at the bottom open to the air. I decided not to turn it on. We had been cleaning/hauling/digging for 2.5 days and we felt it by the end of the day. We went back to the Backstreet Pub. 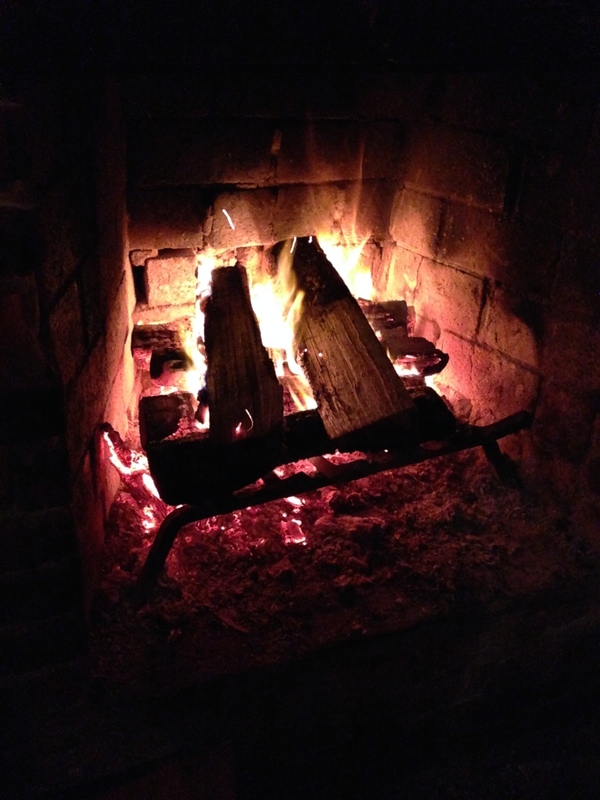 I love me a good fire! Monday we had just a few hours before we had to leave for our flight. 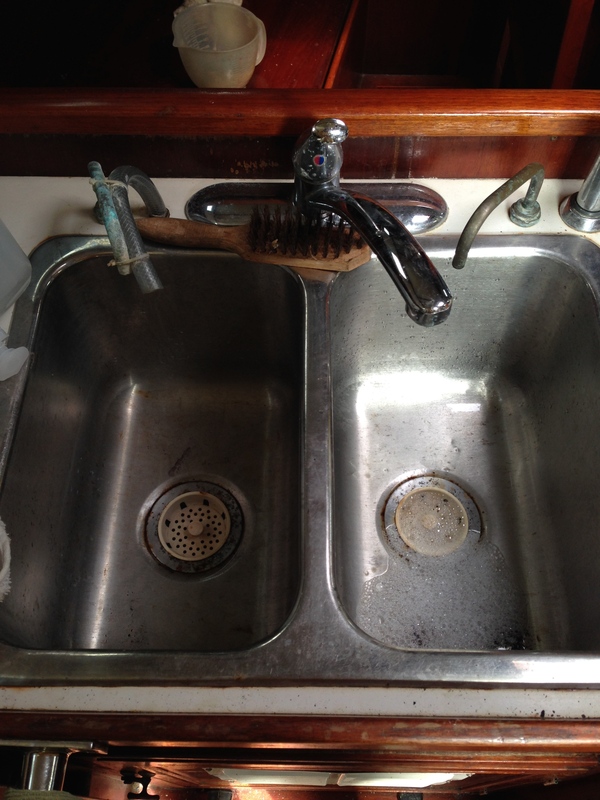 I decided to tackle the galley sink. It took me two hours to achieve this. I cleaned the left side. I’m not finished. More to clean, more to come. This is how it looked when we left. Previous Post Sell all the things!